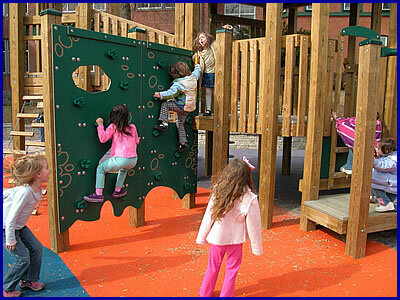 Here are some ideas to consider when designing your playground. 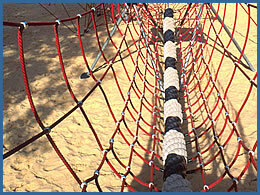 Our complete check list is included in our "Top Ten Tips for Playground Success." Download it now. Settings that are strongly suggestive of real-world situations create a great stimulus to fantasy play. The novelty of a theme setting for any child can be a catalyst to social interaction and cooperative play. 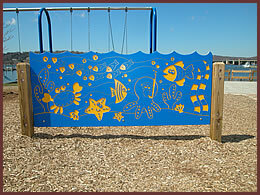 Many communities try to incorporate a sense of their own identity into the playgrounds they build. Their desire to create a sense of place, time, and history is embraced in their design. Infants, toddlers, preschool and school aged children have different levels of physical, social and emotional development. These differences can be nurtured best in a play environment geared to the needs of each group while permitting overlap to encourage exploration of higher levels of difficulty or challenge. Infant play yards allow crawlers and early walkers to explore subtle changes in height and texture. 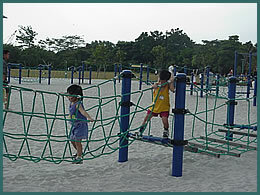 Crawl tubes, stainless steel mirrors, low slides, and pull-up bars can be arranged to create a safe space for them. Often, a toddler’s almost insatiable desire to exercise walking and balancing skills is best met by an "up and down scape" of subtle changes in level, to climb and crawl over and under, to hide and feel safe inside. 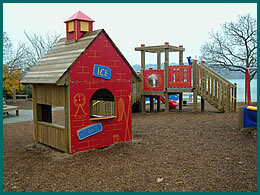 All of our playgrounds are designed to address specific developmental objectives. Good accessible playground design provides participation, variety, physical comfort, and safety for all its users by incorporating rather than segregating differences. When accessible ramps are used as an element of the structure, we design them to be multi-functional. The primary function of the ramp is to provide elevated access between platforms of varying heights and the added value is the particular sensation one experiences when crossing its surface. 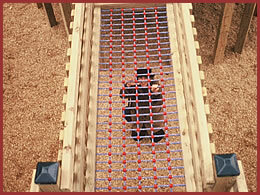 Playgrounds can be natural meeting places for both children and adults. Children meet to play together, talk together, and to simply "be" together. 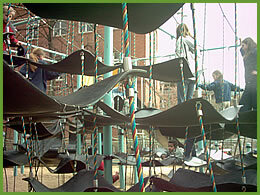 Adults use playgrounds as meeting places too. The community built process goes a long way toward forging friendships within the community during the planning and building stages of the playground. Children are far more interested in HOW they get somewhere than in where it is they are going. Children need to know what it is like to have their heads spin, stomachs sink, bodies tingle, to swing and feel lightheaded, float and feel weightless, hang and turn the world upside down. Most movements need to be performed in many different ways. Our over 60 components have been designed to honor the range of movements children employ.